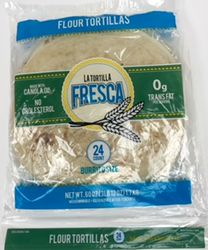 LaTortilla Fresca has made these exceptional flour tortillas which offer that precooked texture and rich taste of a homemade tortilla. Try these them and make them your favorite. Ingredients: Enriched wheat flour (bleached wheat flour, niacin, reduced iron, thiamine mononitrate, riboflavin, folic acid), water, canola oil, rice flour, salt, dough conditioner (invert sugar, propylene glycol and sodium sorbate), baking powder (sofium acid pyrophosphate, sodium bicarbonate and momnocalcium phosphate), calcium propioonate and fumaric acid. Contains: Wheat. Tortillas are made fresh daily and will remain fresh when they are delivered to your door. Just refrigerate as soon as you receive them and heat on stove top pan or comal. These tortillas are made with canola oil, no lard, no cholesterol, low in saturated fat and with no trans fat. Total package comes with two packaged dozen flour tortillas in a resealable bag (similar to a "Ziplock" bag) that protects freshness and flavor. Microwave instructions to heat half a dozen tortillas are: 1) Place in plastic bag. 2) Heat on high power one minute or until warm, some microwave ovens may vary. To heat a different quantity, allow aproximately 10 seconds difference per tortilla. 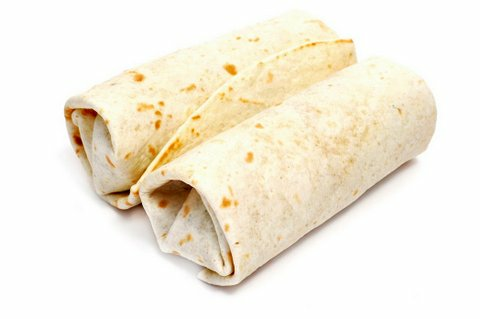 Serving size is one tortilla, with 220 calories each, from fat are 70 calories. Total fat is 7g or 11% of daily value. Sodium is 270mg or 11% of daily value, no trans fat, and no cholesterol. Enjoy! Flavorful and easy to work with.